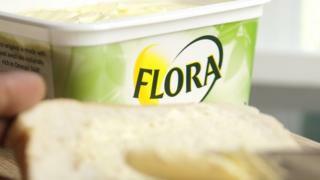 Unilever has agreed to sell its margarine and spreads business, which include Flora and ProActiv, to private equity giant KKR for €6.8bn ($8bn; £6bn). The move follows a wide-ranging review of its business which was prompted by a takeover attempt by rival Kraft. Unilever said it would look for a buyer of the spreads business in April. At the time, it said the firm would step up its cost-cutting, aiming for a 20% margin by 2020. It said the margarine business was a "declining segment" that could be "better managed by others". As well as Flora and ProActiv, it also owns I Can't Believe It's Not Butter and Bertolli. Paul Polman, chief executive of Unilever, said: "The announcement today marks a further step in reshaping and sharpening our portfolio for long term growth. "I am confident that under KKR's ownership, the spreads business, with its iconic brands, will be able to fulfil its full potential as well as societal responsibilities." Unilever's other household names include Persil, Domestos and Hellman's mayonnaise. It operates across more than 190 countries. The deal is expected to be completed in the middle of next year, and is subject to regulator approval in certain jurisdictions.